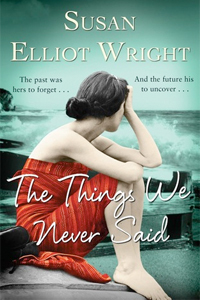 The Things We Never Said is a gripping novel set both in past and present, and as the two timelines come together it unravels a slew of secrets that turn the lives of the main characters upside down. The story starts off in the 1960s with a glimpse into the life of Maggie. One day she finds herself in a psychiatric ward without any recollection of how she ended up there or the knowledge if she even belongs there. Throughout the novel she, and with her the reader, uncovers her past to explain that petrifying and confusing first scene (the "treatment" in the hospital was particularly stomach churning). In 2008 there is Jonathan. He is reasonably happily married with a baby on the way and has a steady job as a teacher. He seems to have a fulfilling life, but after an incident at his school he finds out something about his family that changes everything he's ever known about himself and which puts his already troubled relationship with his parents under even more pressure. As the stories of Maggie and Jonathan start to intertwine - sometimes in a predictable manner, sometimes in wildly unexpected ways - the timelines and with that the overall arc slowly come together. The Things We Never Said is an extremely intriguing novel; both timelines gripped me from start to finish and while I did see some of the twists coming not once did it deter me from being absolutely consumed by the story and the characters within. Many thanks to Lovereading for an advanced reader copy of the novel in an exchange for an honest review.